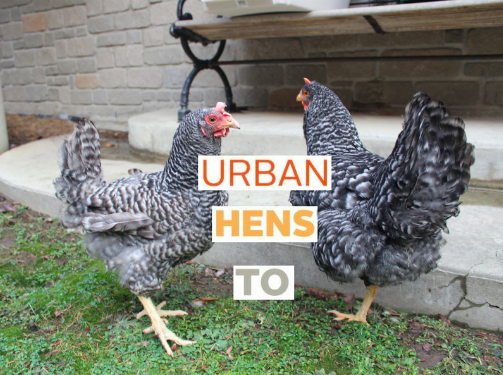 The City of Toronto has launched an UrbanHensTO Pilot Program, allowing residents in four wards across the city to register to have up to 4 hens on their residential property. The pilot will run for 3 years, until March 2, 2021. The Toronto Food Policy Council and staff from Toronto Animal Services have already held two workshops, hosted by local councillors, to help potential hen owners learn more about the pilot requirements, as well as basic care for hens, how to prevent and detect disease, best practices for feeding and care for hens, and coop designs. The pilot is running in Ward 5 (Etobicoke-Lakeshore), Ward 13 (Parkdale-High Park), Ward 21 (St. Paul’s), and Ward 32 (Beaches-East York). The two upcoming workshops are taking place in Ward 5 at the Etobicoke Civic Centre on Saturday, April 14, from 10 a.m. to 12 noon; and in Ward 32 at the Danforth Mennonite Church on Saturday, April 21, at the same time. Ward 13 and Ward 21 workshops have already taken place. If you are interested in more information, including eligibility requirements, visit the City of Toronto’s website here.